1. In a large saucepan add the beef stock, miso paste, soy sauce ,oyster sauce, garlic, ginger and star anise. Bring to the boil and simmer for 15 minutes to infuse the flavours. 2. Meanwhile, slice the beef intro very thin strips. 3. Next, add the mushrooms, pak choi and mange tout in the simmering stock and cook for 3-5 minutes , covered, until pak choi pieces are tender. 4. Meanwhile, in a separate saucepan, bring to boil some water and gently drop the egg. Boil for 4 to 5 minutes. Remove with a slotted spoon and place in a bowl of cold water. Once cool enough to handle peel eggs and cut into halves. 5. At the last minute, add the striploin pieces into the simmering stock and the noddle. 6. Bring to simmer and cook for 2-3 minutes until just warmed and the beef cooked to your liking. Add lime juice and sesame oil and check the seasoning. 7. 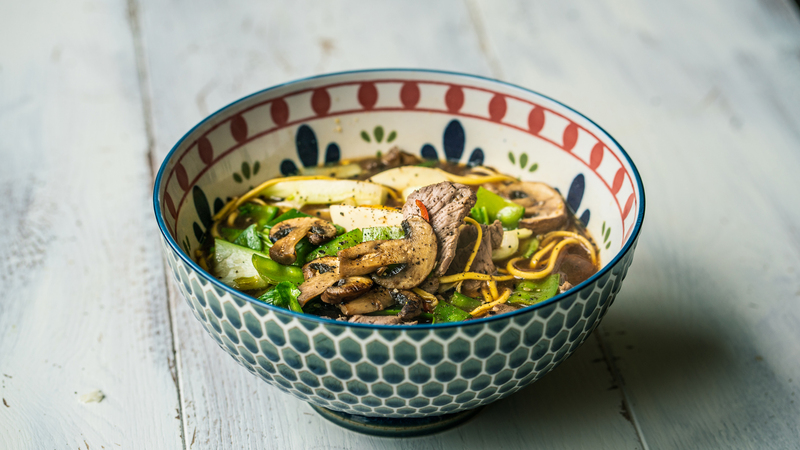 Divide noodles among bowls and ladle the broth with the vegetable and beef mixture. Add the half eggs into bowls. 8. Serve with a sprinkle of sesame seeds, coriander and Sriracha sauce.